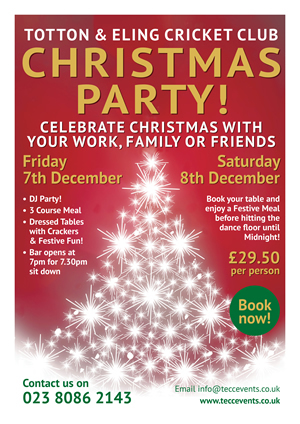 Come and celebrate Christmas with your colleagues, family or friends at one of our fabulous Christmas Party Nights! The Party is from 7pm to 12 midnight and only £29.50 per person. The Night includes a delicious three course meal, dressed tables with crackers & festive fun, and our resident DJ who will have you dancing all night long! We have two nights available this year, Friday 7th December and Saturday 8th December 2018.You can view and download the Menu, Booking Form & Booking Agreement to the right of this page. Is business too busy to have your staff Christmas party in December? Why not celebrate in January with an evening party & buffet! Please contact us for more information.